When we talk about competing modes of transportation we’re usually focused on the strained relationship between drivers and cyclists, or drivers and transit, or drivers and pedestrians. With so much street space taken up by cars, tensions also erupt, of course, between cyclists and pedestrians, and even cyclists and transit. We’ve written before about the problem of leap-frogging, which can result when both buses and cyclists are required to share the right lane. Streetcars are much less likely to pass a cyclist than a bus is, and this, come to think of it, may be one of the many little reasons that streetcars often end up being slower than buses when you control for other differences (in right of way, fare handling, signaling, enforcement, etc). Cyclist friends have often told me that they prefer cycling alongside streetcars rather than buses because streetcars don’t make surprising lateral moves. This is true, though of course the lateral motion of buses is a normal part of how they get through traffic, and how they often keep moving in situations where a streetcar would get stuck. Mia Birk has a good article today arguing that bicycles and streetcars can be friends. So far, though, the only examples she cites of really successful bicycle-transit integration are from streets where there’s plenty of space to separate the two modes, such as Portland’s King/Grand couplet. She’s involved now in a consulting team looking at how streetcars will interact with cyclists along a proposed line on Seattle’s Broadway, and I look forward to seeing what they come up with. 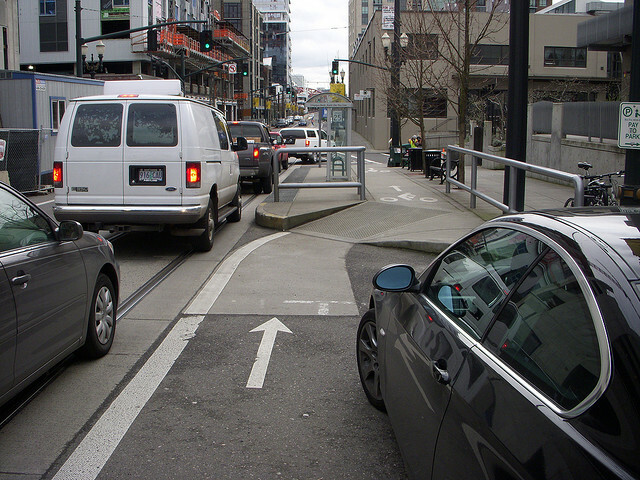 Birk is clear that the basic design of the starter streetcar lines in Portland in Seattle — operation in the right-hand (slow) lane next to a row of parked cars — didn’t provide good options for cyclists needing to avoid the hazard of the streetcar tracks. She wants to see better separation, but when looking at a dense urban street like Seattle’s Broadway, it’s hard to see how they’ll deliver that without undermining either on-street parking or pedestrian circulation. She notes one situation in Portland (14th & Lovejoy) where the streetcar-cyclist conflict was arguably resolved at the pedestrian’s expense. Walker makes a good point that introducing new transportation options will add to the complexity of our streets and introduce new situations. Tensions between modes of transportation may never be fully resolved. Still, it’s exciting to think about the progress and freedom all the those options represent. Elsewhere on the Network today: Copenhagenize reports that, to improve bike safety, its namesake city is moving to allow cyclists to travel both ways on streets that are one-way for motorists. The Wash Cycle comments on the confusion caused by conflicting messages about right-of-way on bike trails in D.C. And Publicola reports that Seattle’s efforts to prioritize biking and transit over driving have helped decrease daily motor vehicle traffic while boosting safety. Toronto has a long history of cyclists getting caught in streetcar tracks that may be worth looking into. Not that either mode is a problem, only that we need to develop appropriate design solutions to reduce the problem.